Powell Crosley had made a fortune before the war manufacturing radios and refrigerators. He had a dream to start his own automobile company in 1939 to make a range of small cars, vans and trucks powered by air-cooled 2cylinder engines. 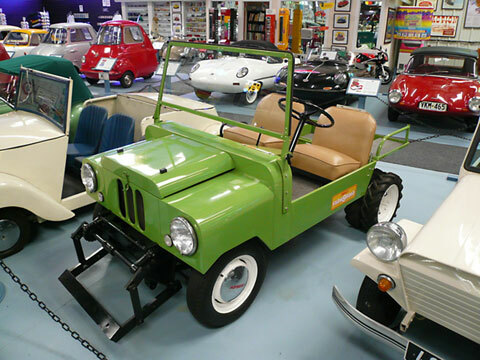 Crosley was also interested in farming and developed the Farm-O-Road based on the original JEEP to be a dual-purpose vehicle, but on a much smaller scale. It had 2 gear ranges with six forward speeds. It could pull farm implements, front and rear optional power takeoffs could handle a number of tools. When not used in the fields, the Farm-O-Road could take to the streets with a top speed of 40-50mph. A fabric top and side curtains were available for protection from the elements. It was not a sales success though with only about 600 units built during its lifespan. Built in 1947 and tested and modified through 1949. The Farm-O-Road went into production and was sold for 3 years 1950-1952. Crosley motors went bankrupt in 1952, but the Farm-O-Road was brought back later as the Crofton Bug by the Crofton Marine Engine Company. But even then only around 200 examples were built. This is one of 2 prototypes built, the existence of the other is unknown. Most of the pictures in the sales catalogs and promotional posters were of this vehicle. Manufacturer: Crosley Motors Inc. Cincinnati, Ohio, U. S. A. Model: Farm-O-Road prototype Motor: Crosley Cobra Body: Steel & Alum.